Glue ear is a childhood condition which can cause some loss of hearing. It affects the middle ear and there are usually no external symptoms. The main symptom of glue ear is a hearing loss which may range from very mild to moderate. Other symptoms include earache, irritability, clumsiness, balance problems and difficulty sleeping. Glue ear is a build-up of fluid in the middle ear. This is the area directly behind the eardrum. The fluid prevents the three tiny ear bones from vibrating properly, meaning sounds aren’t transmitted from the outer ear to the inner ear, resulting in sounds being muffled. Glue ear is a common condition especially in children between the ages of 2 and 6. 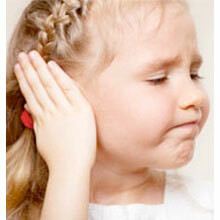 It may be unilateral (in one ear) or bilateral (both ears) and often occurs after an ear infection. It also occurs most frequently in the winter. Although the exact cause of the injury is unknown, what is known is that it is not caused by water in the ear or excess ear wax. Changes in ear pressure (as occur on flights and at altitude). Irritants such as cigarette smoke and chemicals. Gastric fluids from the stomach that leak up through the throat and into the Eustachian tube. In most cases, glue ear does not require any treatment and will clear on its own within 3 months. There are currently no medications which have been shown to be effective in treating the condition. Surgery is rarely offered for glue ear unless hearing loss is significant and it affects both ears, or there is a pre-existing medical condition which may affect the child’s development. Such conditions may include autism, Down’s syndrome, a cleft palate, blindness or other speech and language disorders. Surgery usually involves the insertion of grommets to keep the eustachian tube open. Other procedures include the removal of the adenoids. These are glands at the back of the throat. If they become inflamed they can block the eustachian tube. Hearing aids may be used as an alternative to surgery.